It's really strange, but my pickiest eater just loves bean salad. Luckily, it's the sort of recipe you can make when you only have pantry staples. It's flexible and easy. Mix together last four ingredients and toss with beans. Refrigerate, stirring on occasion, for four hours before serving. Bean salad used to be a staple of USMC field messes during the 1970's and 1980's. I think because the cooks could make it out of canned vegetables when there was no fresh food. Field messes had to serve meat, a starchy vegetable, and some kind of salad along with bread in those days. dat ziet er erg lekker uit. Now that is something that I like as well, he might like it as it is nice visually, tastes good and is kind of finger food if nobody is watching. 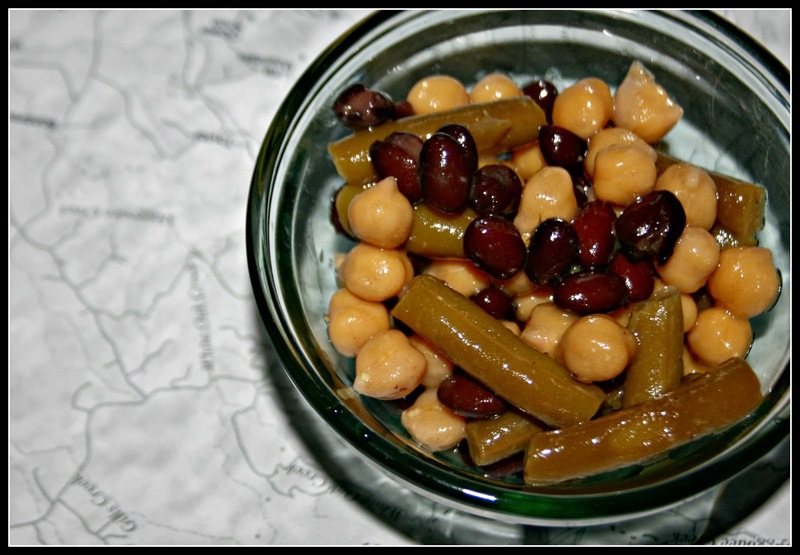 Hubby makes a similar bean salad, but his doesn't have black beans. Looks yummy. We have or Patty makes a bean salad that we love. Adults like it better than kids in the 14-15 year range. This looks delicious! We will have to try it. This is one recipe I'm going to try. It looks really good! Funny what grabs their attention. I never really cared for this dish. My church is famous for this when they have dinners. This looks yummy, and easy to make! I am definitely going to make this, sounds yummy! YUM! I love chickpeas and Dijon mustard. This must be a winner! It's tasty! I just made a batch for dinner tonight. Thanks Reid! That is strange that your picky eater likes bean salad! But it's great since beans are really good for you. Looks yummy! That does look so good. Isn't it fun watching the kids as they begin to see what tastes good to them. And, I think it's essential to start them early on different foods. Bean salad looks good. Reid must be very discerning! Looks delicious and healthy. John's mom made something similar. Thanks for sharing. I should be make it from my fresh veggies. it looks so yummy and so easy! I have got to try this recipe. I love bean salad and just never find the time to make it. Your recipe sounds so easy. Thanks for sharing.